What vegetable could possibly be easier to grow? You push one bulb into the soil in spring and by midsummer it has multiplied into a dozen or so. With more flavor and less pungency than onions, shallots are also a versatile ingredient in the kitchen, delicious roasted or in casseroles. As they are expensive in the supermarket, they must be worth the space in any garden. Although they do not qualify as an attractive border vegetable, try pushing a few into an ornamental border early in the season. They will be harvested and out of the way of summer flowers by July. Shallots are an unfussy vegetable. They will do well on any reasonably well-drained, fertile soil and prefer a neutral pH. They need only a little general fertilizer and in most years will not need to be watered. The easiest way to grow shallots is from sets (small single bulbs). Varieties of shallot are now available as seed. If the soil is still cold and wet, delay planting until April. Prepare the site by forking over to loosen the soil. Work in a little general fertilizer, unless the area has been manured for a previous crop. Do not add organic matter when growing shallots. Push the individual bulbs into the soil so that the tips are just covered. Birds may pull them out if they are visible. Give them more space than onion sets, 15cm apart in rows 30cm apart should be fine. You could space them 23cm apart each way in a raised bed, but allow enough space for hoeing between the plants later. Aim to complete planting by early April. 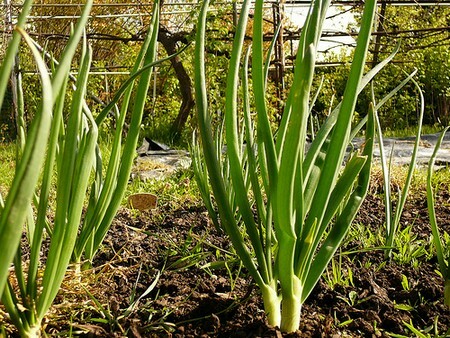 Shallots cannot compete with vigorous weeds, so hand weed between plants and hoe between the rows regularly, taking care not to damage the plants. Keep weeds under control. Shallots do not normally need watering, but in a very dry summer, a soaking when the bulb is swelling and dividing increases the yield. As soon as the top starts to dry off, lift the clump of bulbs out of the soil to expose it to the sun. Leave the bulbs to dry and ripen in the sun. But cover them with cloches or bring them indoors to complete drying in wet weather. Lift and store bulbs when fully ripe. Fully-ripened shallots should store well into the following winter and early spring. Spread them out in a single layer on wooden trays or wire racks, and keep them in a cool, dry place. If you keep them beyond New Year, check occasionally for signs of rotting.